My, oh my! If one size fit all back in the 1940s, grown women must have been like children. I know shapes and sizes have changed since then, but this Hollywood 1667 pattern is really something! I've made views 4 & 5 many times before, but this time making 3 & 5, I stupidly forgot to grade up. The result...extra small pinnies! Never mind, they're still super cute I think so they may make it into the upcoming Etsy store...just listed as XS! This was my first time making view 3 and it's actually very simple, but with impressive details, like the bows on the neckline and on either side of the waist band. I ldo ove the ribbon, although any tips on how to stop it from fraying would be welcome dear readers. I pinked the ends and covered them with a lick of clear nail varnish. There must be a better way though...anyone? I'm also making some very slow progress with Casey's swing dress sew-along. I've finally pieced together the ePattern and cut it all out. I've yet to measure myself, make the necessary adjustments and cut out my actual size. I think this will be more 'sew catch-up' and less 'sew-along'. But I'll get there in the end, I'm certain of it! Dear readers, this weekend I've experienced a rollercoaster of emotions, culminating in a major meltdown this morning. I woke up at 9am to get lots of sewing done, but instead I ended up spending over three hours looking for my plastic container which holds many of my sewing machine accessories...and most specifically...my overcast foot. I only realised I had an overcast foot a few weeks ago and on the day that I wanted to try it out, the whole container went missing. I searched everywhere over and over again, I screamed, I may have kicked a few things and then I cried. I'm afraid that it's gone for good, so I'll have to fork out some cash and order a new one! I wanted this foot to finish off the inside seams of some cushion covers I'm experimenting with for my upcoming Etsy shop. Instead, I went ahead and made a couple, which I'll have to tidy up once my new overcast foot arrives. I think this morning set the tone for the rest of day, because it seemed that I even had difficulties making easy peasy cushion covers. My main issue was with sewing the zips in. I followed a YouTube tutorial which advised sewing both edges of the cushion side and leaving a gap for the zip. 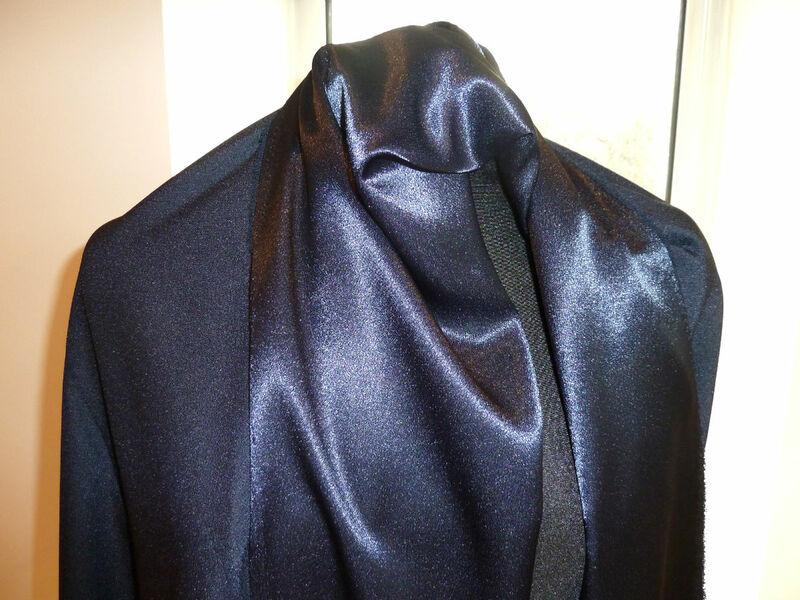 It seemed straightforward, but both times one side of my fabric would pucker, forcing me to rip seams and re-sew parts. If anyone has any good tips to share or knows of any good tutorials, I'd really appreciate hearing from you! Anyway, I'm pretty happy with the final external result, but I do need to make them a bit smaller for a snugger fit on 16inch cushions. The fabrics from 'M is for make' are delicious though! In other news, I got as far as I could with my 'homework' from my Pattern Cutting & Garment Making college course. Hopefully on Wednesday I can finish my bodice block and cut the muslin out. I also printed out the ePattern for Casey's swing dress sew-along and it's truly intimidating. I haven't a clue of where to start, so I've naughtily put it to one side for now. I hope to give it my full attention during the week sometime. Can anyone out there help me please? I'm trying to complete my bodice block 'homework' from college, but I've reached a stumbling block relating to the term 'bust separation'...eek! I've tried looking online and in my comprehensive sewing books, but it seems that there are so many different ways of drafting patterns and my head is ready to explode. If you can see the images below clearly, I'm trying to plot point 22, which looks simple enough. I've got my bust line plotted, but the directions for point 22 are: bust point – half bust separation, applied from centre front. What on earth is a 'bust separation'??? Can anyone shed some light on this? I'm so eager to progress that at this point I don't even mind exposing my sheer lack of knowledge! Anyway, thanks in advance for any guidance. I appreciate it wholeheartedly! It's officially Saturday and I'm excited to announce the winners of my 50-followers giveaway!!! Thanks to everyone who entered, it was great to hear which (if any) sewalongs you are taking part in...the most ambitious by far being Handmade Jane. I'm only attempting Casey's swing dress sew-along, don't want to push my luck just yet! Donna over at Sew Much Stitching won the McCall 6324 – good luck with the up-scaling, I'd love to see how it turns out. Can you reply to this post with your email address please? Dawn at Eleen Fashions won the Butterick 6947 - can't wait to see this beauty made up! I've got your email address, so I'll drop you a line shortly. Sorry you couldn't all be winners, maybe next time!?! This one's for all my lovely followers! I never thought I'd get anyone to read my sewing ramblings, let alone a whopping 50 people! To show my appreciation and to celebrate this achievement, I've got a couple goodies to giveaway...whoop, whoop! 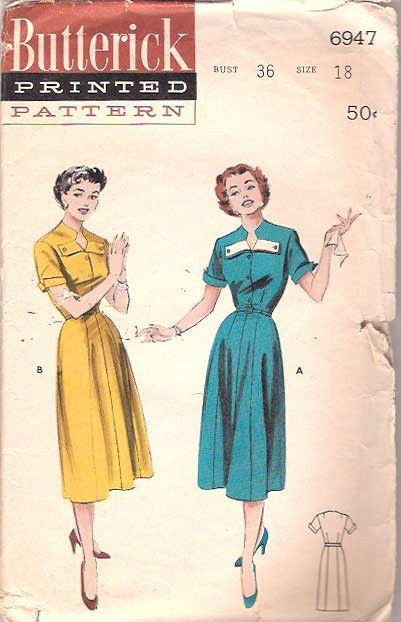 Then we have Butterick 6947, size 18 (bust 36, waist 30, hips 39) – copyright 1950s? I just love the keyhole neckline and detachable tabs! You need to be a follower of my blog and I'd love to hear if you are taking part in any sewalongs this year. There seem to be so many great ones on offer! In your message let me know which pattern you would like to be entered for - it could be one or both. Please include an email address so I can get in touch. I'm happy to ship to any country. I'll announce the winner(s) right here, this Saturday 15 January. Good luck one and all! Once again, thanks so much for all you supportive comments over the months, they mean the world to a newbie sewer like myself! Yay, today my first ever fabric order from M is for make arrived and I'm delighted! I only recently discovered the M is for make blog and shop, though the lovely Handmade Jane blog and my only regret is that I didn't know about it earlier! The best part about my purchase – apart from the super fast delivery – was that most of my fabric choices just so happened to be on sale! With this post, I'm officially starting 2011 as I intend to continue it...by sewing as much as possible without taking the fun out of it! I'm very proud of this little number and despite its little imperfections I know I will be wearing it a lot. The pattern is for a dress which I somehow managed to convert into a cropped blouse, simply because I thought it would make a nice one! 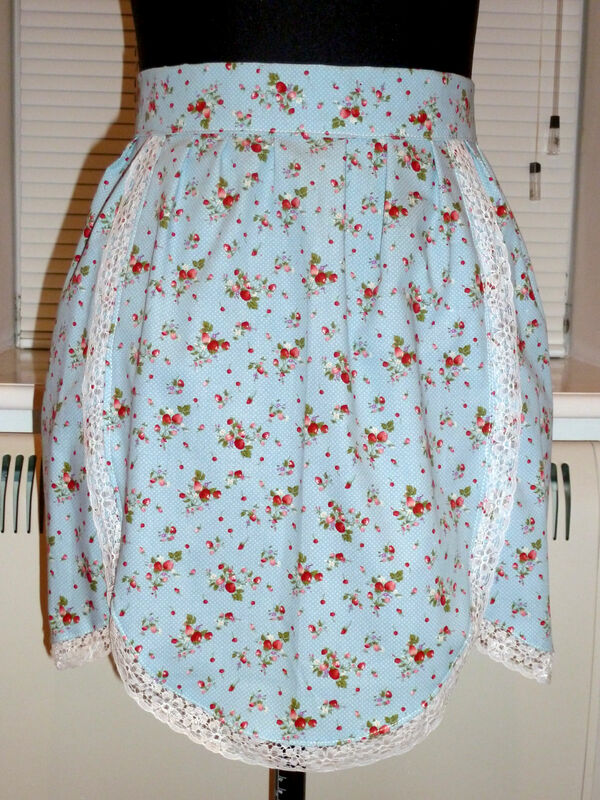 I even adapted the original closed-back to a buttoned-back instead, as I love back detail of all kinds. I'm tempted to make it up as a longer blouse too, just because I'm smitten with the sweetheart neckline! Ironically, it's adapted from Simplicity 1598, which I started last August and have yet to finish. All it needs is a side zip and hemming...it's one of my New Year's aims! 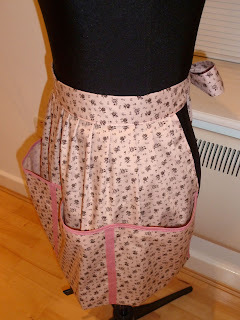 Also on the go...wait for it...yes, it's another apron! This one is destined to be a birthday present for someone in March, can you tell that I'm eager?!? Happy New Year everyone, I hope you've all been enjoying the festive season! Like many fellow bloggers and sewers, I've decided to reflect on 2010 and set myself some aims for 2011, much like Tilly's 're-sew-lutions'. I've had my blog for eight months and I've been sewing for just over a year. I've loved blogging more than I imagined I would, especially all the support out there and all the wonderful hints and tips that are so readily shared! 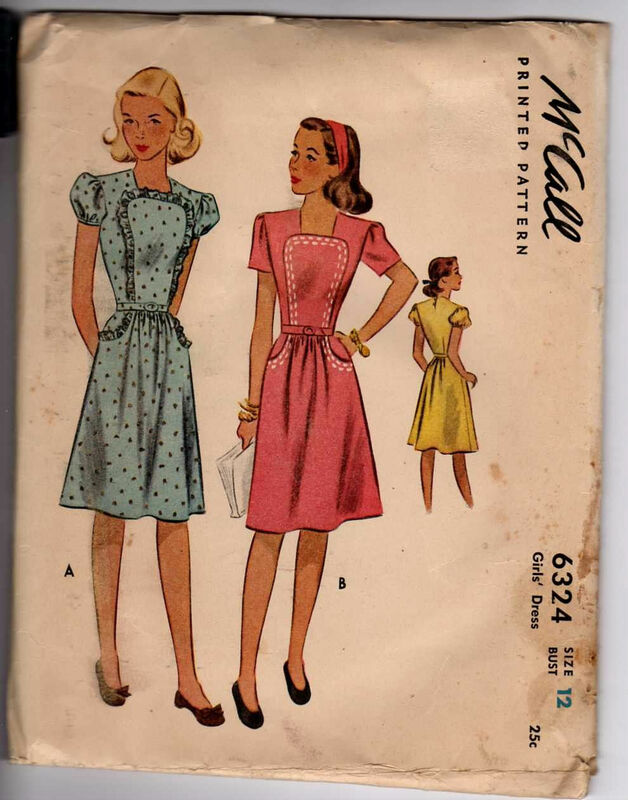 I've also enjoyed discovering Sew Retro, a passion for bygone fashions - especially the 1930s and 1940s – and indulging in buying lots of vintage sewing patterns (some would say too many) and fabrics. I am disappointed with my sewing progress though, as I've never worn anything I've made, due to poor quality stitching and fitting. Remember these? Find / make more time to sew! Become an accomplished seamstress by taking away some crucial skills and knowledge from my 'Pattern Cutting and Garment Making' course. Overcome my nervousness of sewing some of my divine 1930s and 1940s dress patterns. I'm frightened of not doing them justice and losing all confidence...but if I don't get stuck in I will never grow as a seamstress! Join my first ever sew-along! I'm loving the sound of this one from Casey's Elegant Musings, especially if it goes ahead as the 1940s swing dress! Perhaps this next aim is a little ambitious, but what the heck! My boyfriend's family have a near-new overlocker that I can have. This excites and scares me at the same time! I would love to be able to finish my items professionally, but will I be able to figure it out without butchering my items?!? Seeing as I've had some delightful feedback on my aprons and a handful of happy paying customers, I would love to open an Etsy store and...dare I say it...sell some?!? I've got some lovely patterns to work from / adapt and I've had some ideas for my own designs. This would be a fun little sideline as well as my full-time job of course. Linking to the above, I'd like to make make a light-box / tent, to make my photos better. I love our flat, but spotlights make for dreadful photography lighting! The British weather also means I can't take good outdoor shots for the majority of the year. Vogue 5510 – I started this in May 2010 (May!!!) and had severe fitting problems with the bodice. It's such a beautiful pattern and I'd love to give it another go! Simplicity 1598 – I started this in August 2010 and just never finished, it even though all it needs is a side-zip and hemming. Ridiculous huh!? Should be a breeze though! Well, this should certainly keep me busy for the duration of 2011, if not longer. I may have been too ambitious with my aims, but I'm at the very least I'm starting the new year with good intentions!